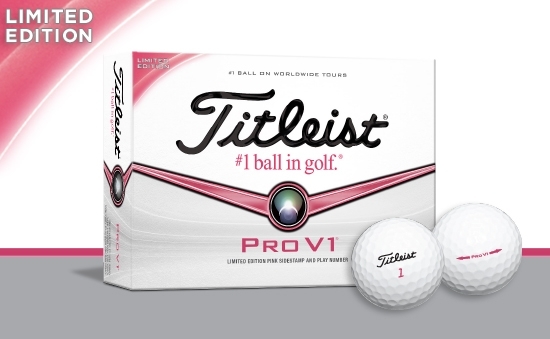 Introducing the new 2013 Titleist Pro V1 Limited Edition golf balls with pink sidestamp and play number, now available in golf shops for a limited time. You'll be able to spot Pro V1 Limited Edition golf balls in your golf shop by their limited edition pink-and-white packaging (pictured above). 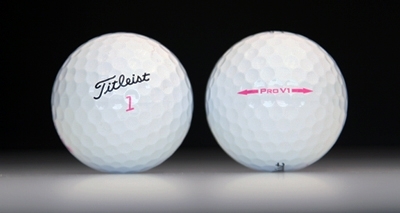 The performance of 2013 Pro V1 Limited Edition golf balls is exactly the same as 2013 Pro V1. Every 2013 Pro V1 and Pro V1 Limited Edition golf ball is engineered to deliver exceptional distance for golfers of all swing speeds and skill levels, very soft feel on all shots tee-to-green and longer lasting durability while retaining a whiter, brighter finish throughout the course of play. 2013 Pro V1 golf balls also maintain their renowned Drop-and-Stop control, providing all golfers with the proven short-game scoring performance that contributes to shooting lower scores. Titleist Pro V1 golf balls, along with our Pro V1x models, are the most trusted golf balls at every level of the game, and the #1 performance choice for golfers of all skill levels, handicaps and swing speeds. To learn more about the performance of the new 2013 Pro V1 golf balls, Please click here.. Pro V1 Limited Edition golf balls are now available in golf shops around South East Asia, while supplies last. Please check with your local golf shop for more information on availability and pricing. Pro V1 Limited Edition are available in standard dozens with play numbers 1-4 only and are not available for custom order/imprinting. We hope you enjoy them. Let us know if you have any questions.